I sadly left Tallinn after a coffee and some stale pastry at one of my haunts from the late 1990s, flying out to Oslo for an overnight stop. 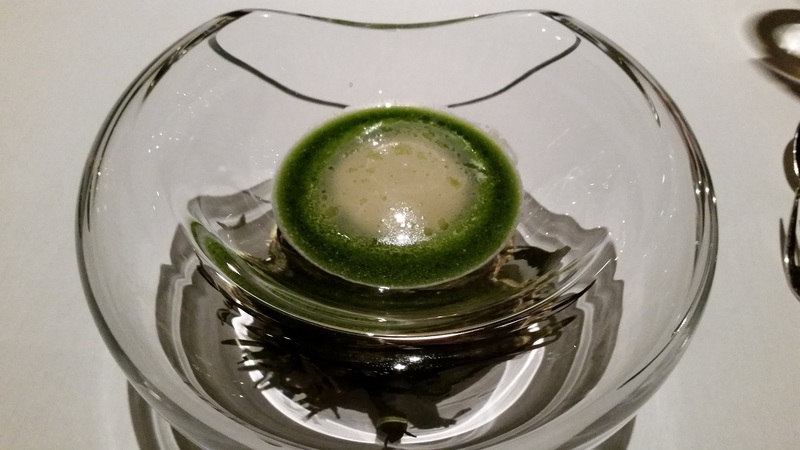 It was not originally planned, but when I saw the possibility of returning to the brilliant Maaemo for dinner that Friday evening I made the detour. 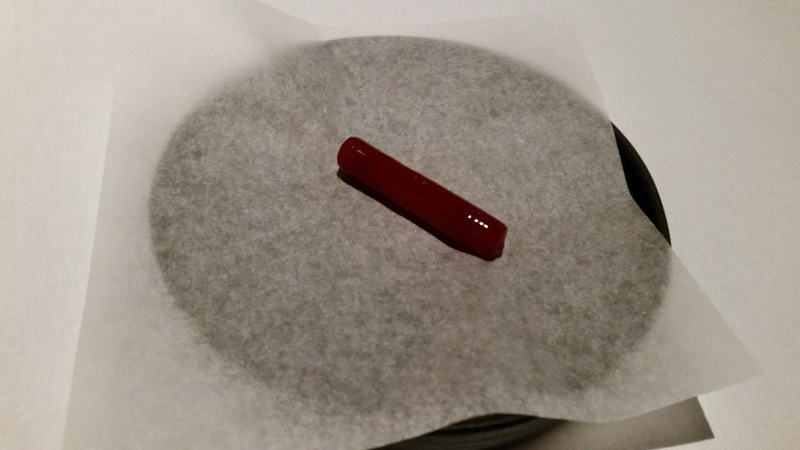 My previous time at Maaemo was for my 40th birthday and it was one of the best tasting menu I’ve ever had, so was hoping for another great night there. 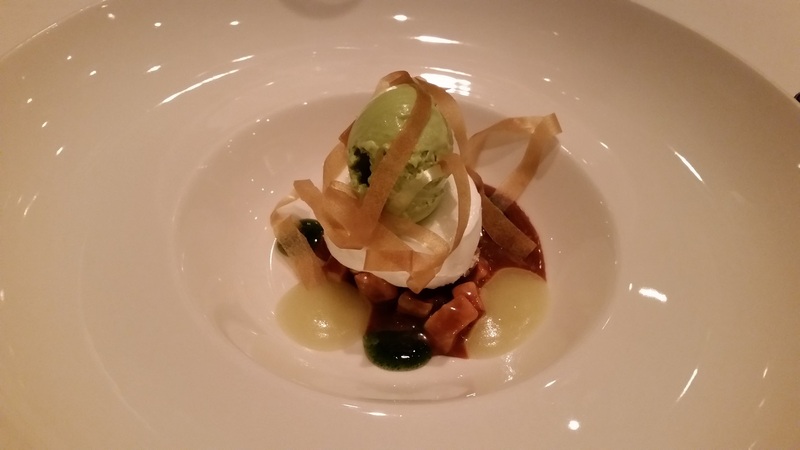 I was staying near the airport overnight so took the pricey train into town and walked to Maaemo. This time there would be no issues about getting lost as I walked up a now familiar path. I was early, but they were already waiting for me. I was actually placed at the same table as I was last time, and with a glass of bubbly in hand I relaxed. Ah, it’s good to be back. The staff made me feel extremely welcome as a returning guest, and that was much appreciated. I was hoping for better pictures tonight with a slightly better camera; I also noticed it was a bit brighter inside than last time. That should help. Soon the first of many, many courses showed up. 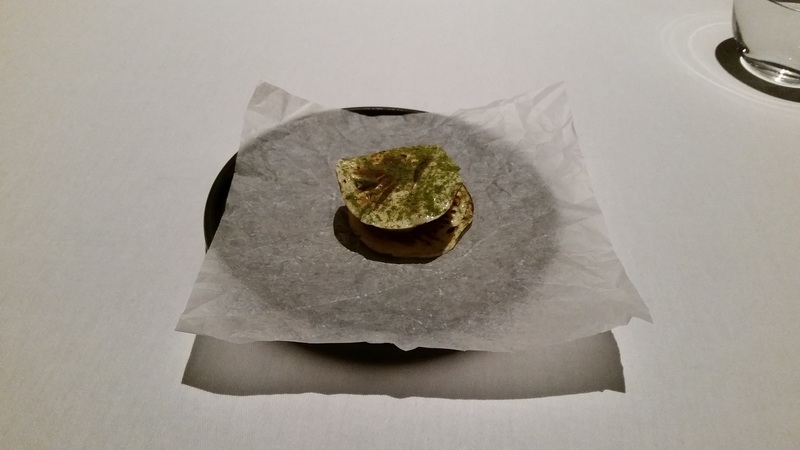 The first series are all snacks, and the opener was a Maaemo staple — a macaroon of nyr cheese with whitefish roe. A nice bite, a sure way of knowing I’m back in Maaemo. 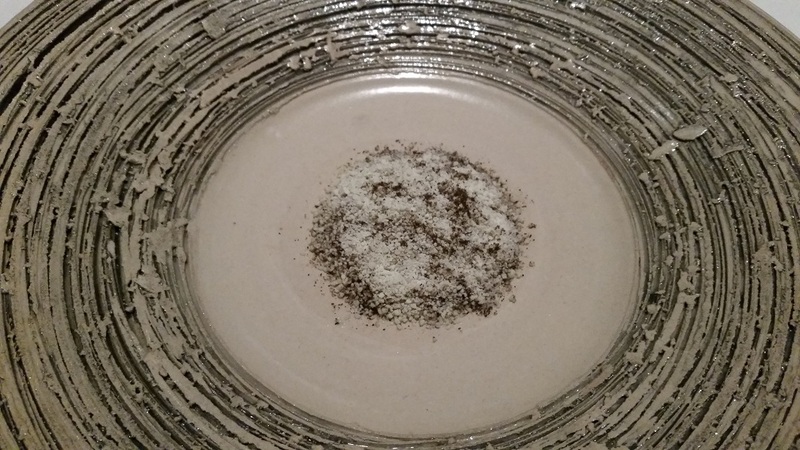 The second snack was a piece of salsify preserved with juniper. 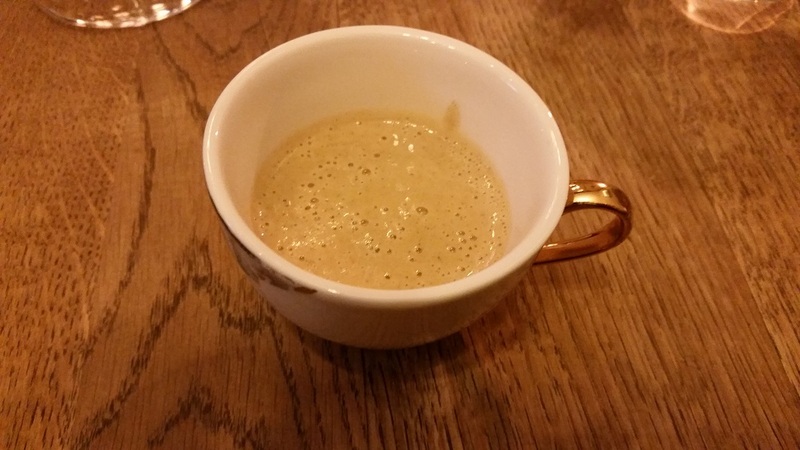 Interesting, and the wooden cup of juniper broth was rather tasty and seasonal. 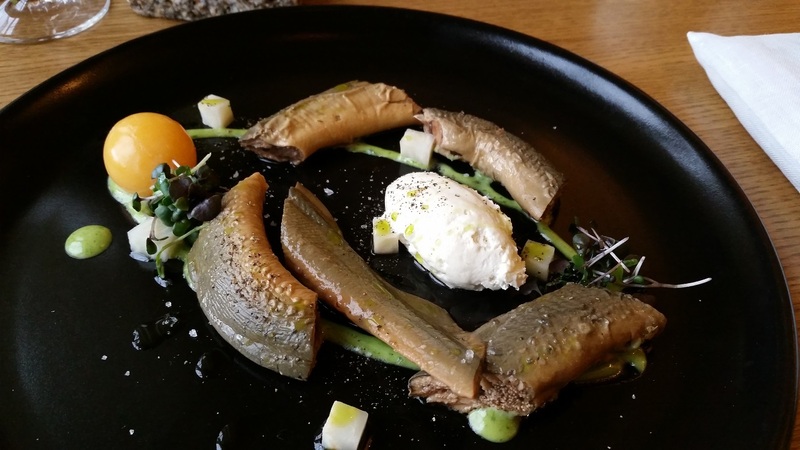 Sorry for the off-focus on this photo, the stupid “picture stabilisation” feature often messes up on the focus on low-light photos… The third snack was based on smoked mackerel. Another tasty treat, as this also featured chicken skin on top. So far this has gone pretty good as the quick-but-not-rushing snack service continued with the humble beet. This interesting modern-traditional preparation has the beet glazed in fermented birch sap, adding an interesting take to the already nice beet. 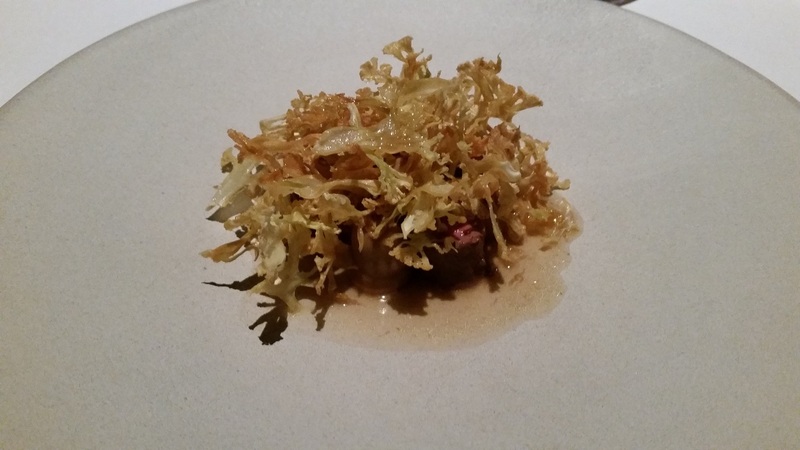 The next dish was another Maaemo staple, the rømmegrøt. The rømmegrøt is a fantastic and rich porridge that’s one of the most traditional of Norwegian cuisine. 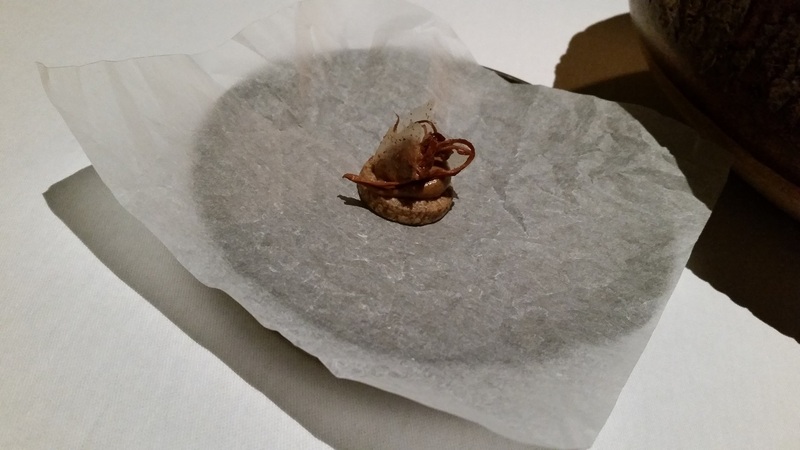 This version boasted a shaving of dried reindeer heart. It was as good as last time I was here! The multilingual cooking staff each brought different dishes down to introduce them, which was interesting to hear all the different accents that span several continents. 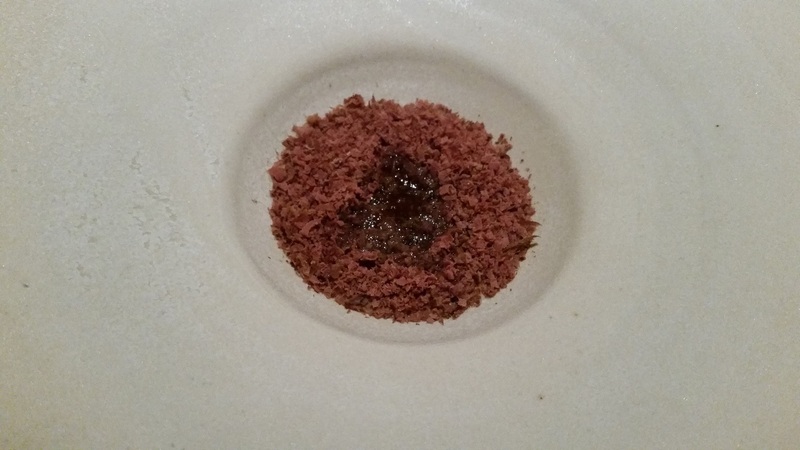 The next dish was a “cornette” of chicken liver and pickled chanterelle. A beautiful presentation, I thought my photo with the candle really added to the visuals (lol). 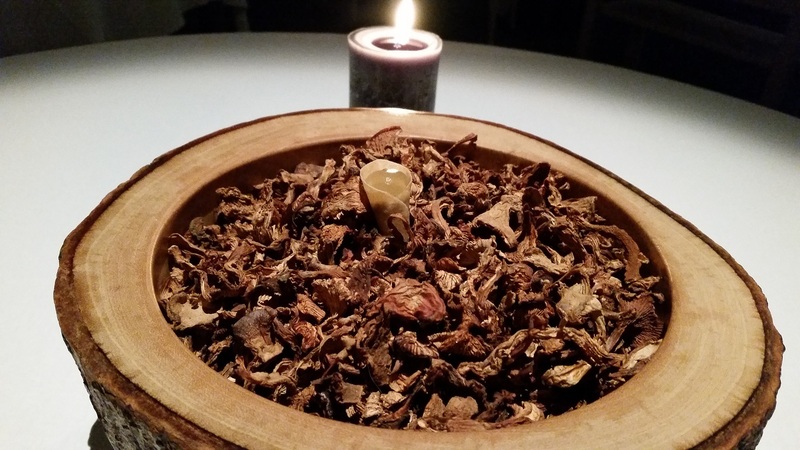 The chanterelle theme continued into the next and final “snack” of a not-so-simple cookie. 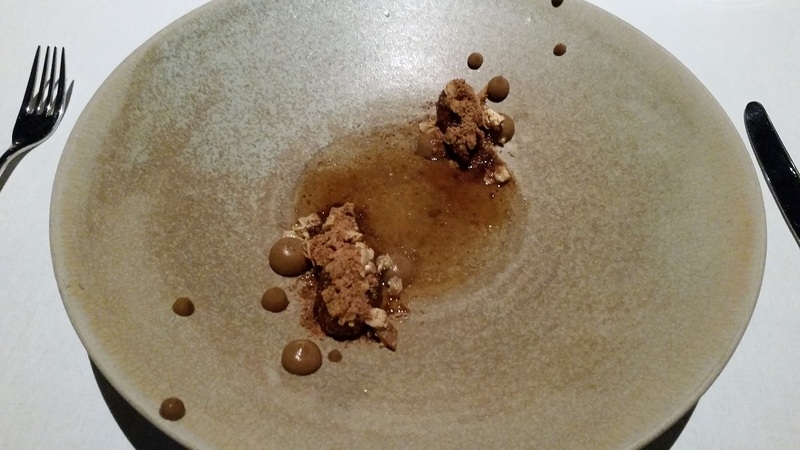 This cookie was made from dried and pickled chanterelles, and dehydrated broth of chicken bones. Pretty intense stuff, loved it. There is a deep love of chanterelles upstairs in the kitchen, and I really liked this item and how focused the flavours were. 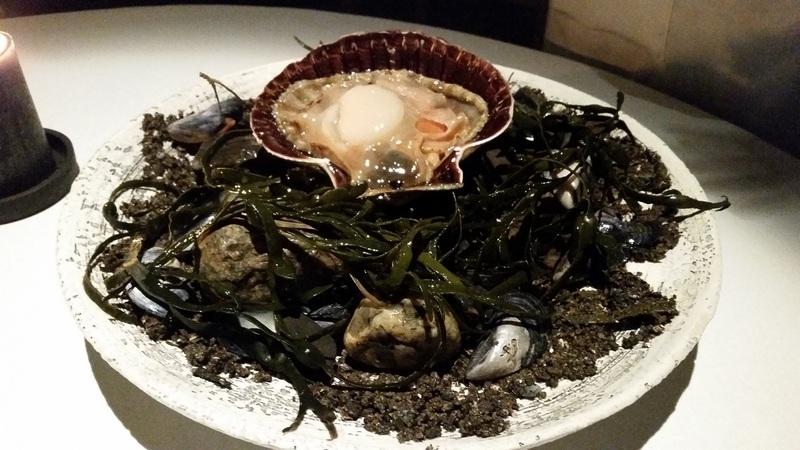 We begin to move into larger, more complex items with another of Maaemo’s staples, the oyster. This is one of their best-known dishes, always a beautiful presentation, the oyster bathing in a sauce of mussel and dill. Wonderful flavour, I can eat this time and time again. Mmm, can’t wait for that! The seaweed looked good too! At this point we had an interesting small dish of carrots and salmon. 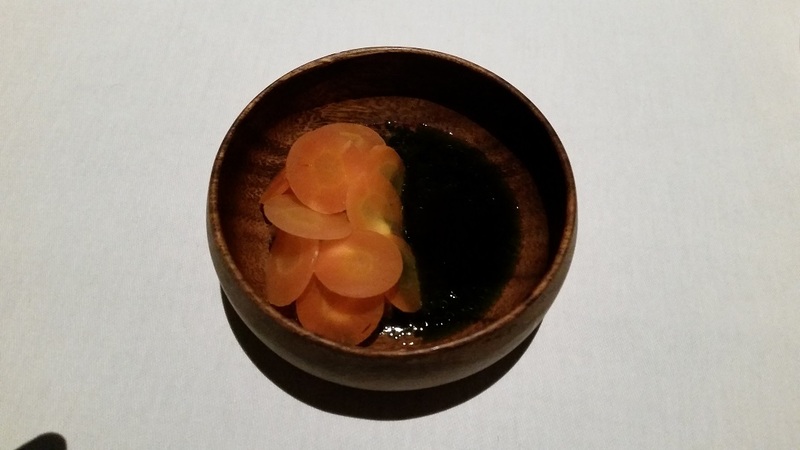 This small treat was all about the carrots, which was preserved in a traditional fashion. The salmon was understated though. 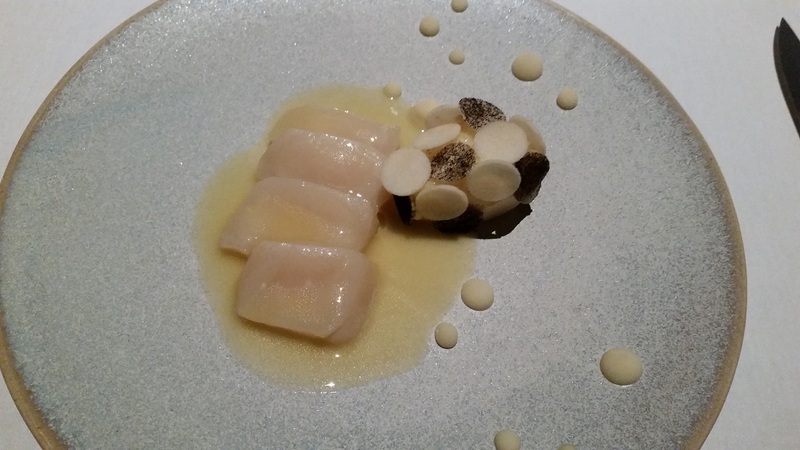 After this, the scallop in question was the next offering. 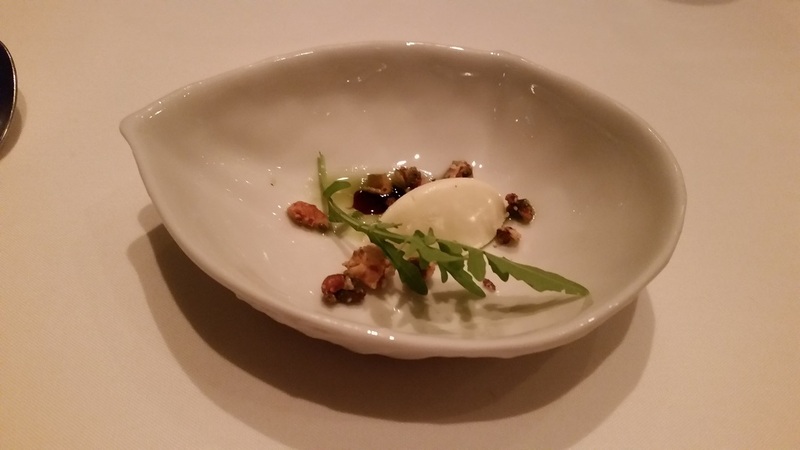 This tasting of Finnish caviar really wasn’t the star of the dish. 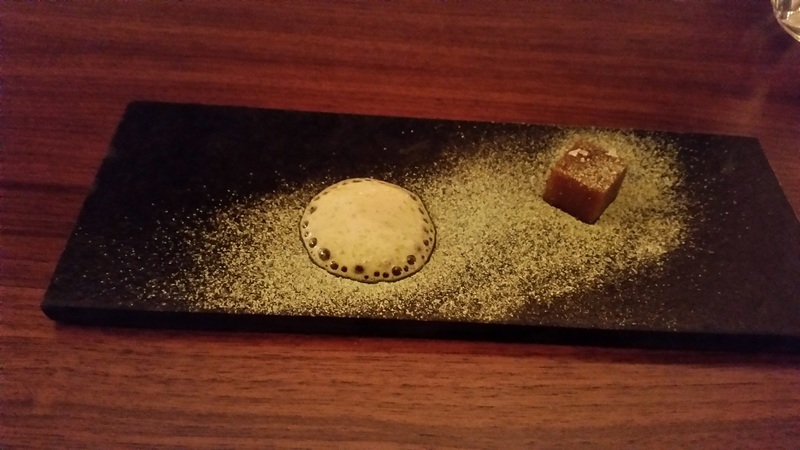 It was actually the roasted chestnut puree. Wow, it was rich and the aroma was just heavenly. Fish eggs, what? But really, a wonderful contrast here of salty and sweet. 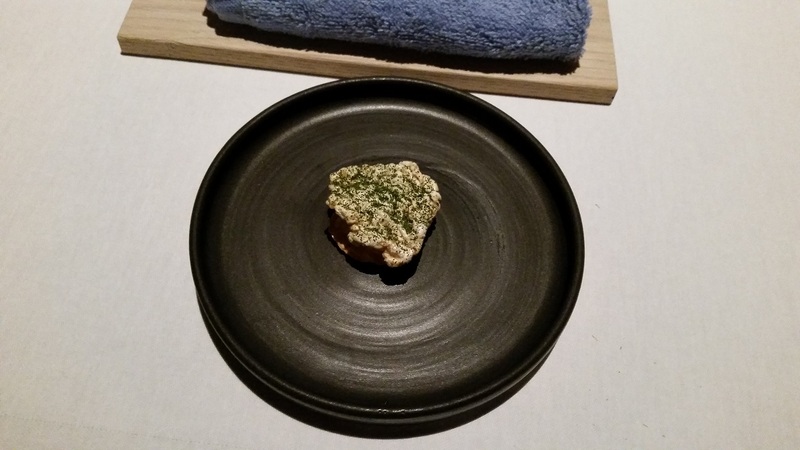 The next dish is another of Maaemo’s staples, the bread course. 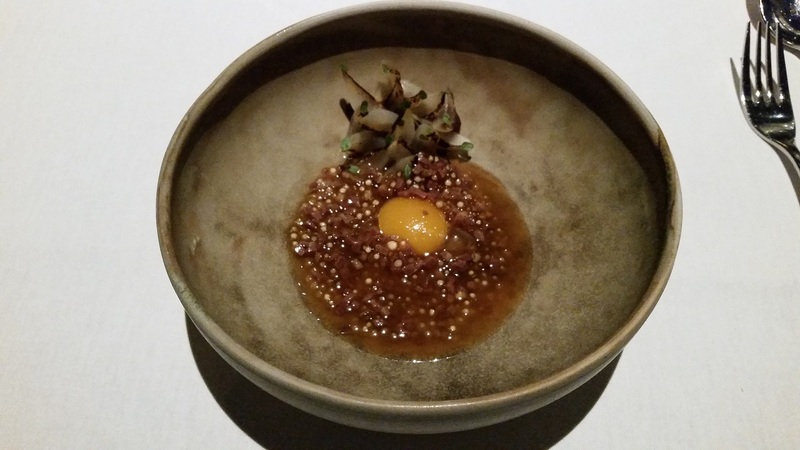 The following dish was the charred onions and quail egg in a bone marrow and onion vinaigrette. There was also fenalår, which I wished was more prominent. Didn’t I say that last time here as well? Then we moved to the final savoury dish, the reindeer. This was delicious but a modest portion, which was good as I was starting to feel the bloat. Love the presentation. The staff was very happy as this was the first of the season. Delicious and tender, a wonderful seasonal dish. At this point I also had the chance to catch up a bit with Pontus Dahlström, the master of the front-of-the-house at Maaemo. Was good to be back and have a good chat before the dessert courses began. “The smell of the blackcurrant bush” as they call it, excellent taste of the currant in this very cute dish. Next up is an ice cream sandwich layered with grilled milk and spruce ice cream. 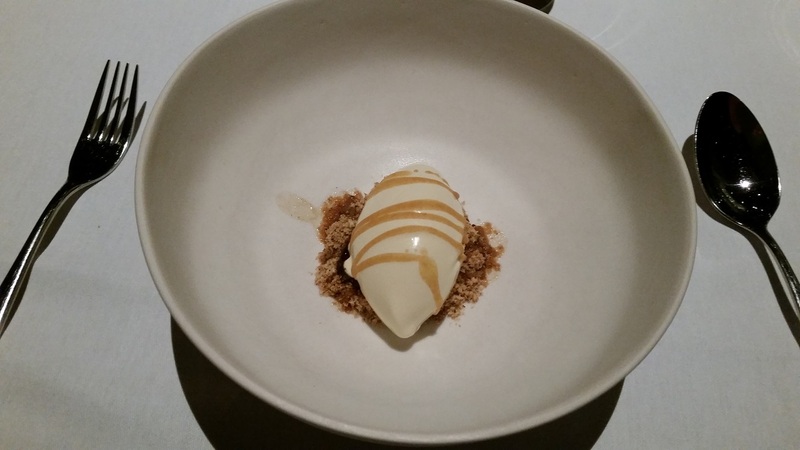 This ice cream is made of brown butter, accentuated by hazlenut and molasses. A sweet finishing course. At this point I was invited up to see the re-organised kitchen and to have a chat with chef. Esben Holmboe Bang is a man devoted to his art and craft, and we talked about the refining of the cuisine and cooking since my last visit. I brought up the bread-and-sunchoke-bloat thing (sorry! ), but agreed it was more refined. I love how he plays such a teaching role to his young team, some hailing as far as from Nebraska and Australia. I took enough of their time so I headed back down for a series of closing dessert snacks, which of course ended with another of Maaemo’s staples — the macaroon with nyr (same as the opening savoury snack), but this time graced with sea buckthorn. A perfect close. Sorry, the picture came out very bad. I actually stayed for some extra drinks after this, chatting with some members of staff front and back of the house. A little hiccup in service as they were very busy, but all was good. I headed out more than happy, though the bill was an anvil in my pocket. Thank goodness the Norwegian kroner was so weak against the dollar thanks to the cratering of the price of oil. 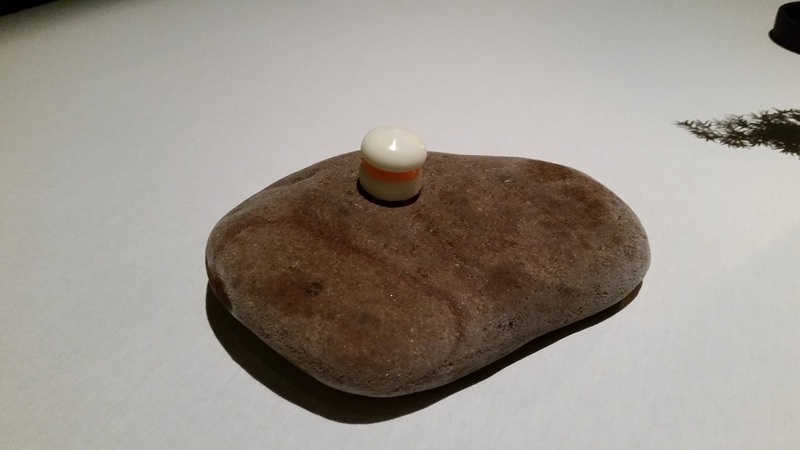 Maaemo proved itself again as one of the very best in the food world today, with a chef that is both creative and inventive, with some of the best service in Europe — better than a slew of 3-star Michelin places. This restaurant needs to be elevated from 2-star to 3-star soon. A must for anyone who loves great cooking! Yes, it is pricey as hell, so take advantage of the weak kroner now! After that little adventure I hopped on a bus back into town and jumped off at the Kadriorg neighbourhood and headed to a restaurant that everyone in that part of town raves about, Salt. Salt is a small basement restaurant that looks like a pure labour of love by everyone there. Simple, but solid and efficient. Only problem for me was that the radiators were blasting and nearly all tables were against radiator-strewn walls, so I had to move to a middle one facing the front door. Perfect. I relaxed with some wine and enjoyed looking at the Mediterranean-and-Asian-influenced menu. As it was lunch some of the dishes were not available (it’s a very small operation here) since most people went with the daily special. It’s very popular and the place is packed out the door with locals and foreigners with babies (Kadriorg is popular with foreigners with families as houses have more space, alongside the huge park next door). Now this is a huge plate! Garlicky goodness in aroma and taste, these were done brilliantly. 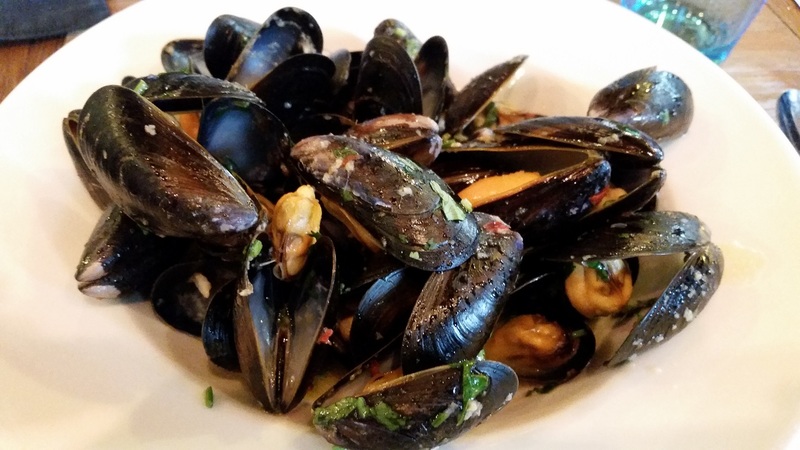 Extremely fresh and plump, I don’t remember the last time I enjoyed a large plate of mussels like this. Touch of chilli to bring it to a perfect balance, and very low on the ginger (which I generally don’t like). I even drank the broth! And that was a starter? 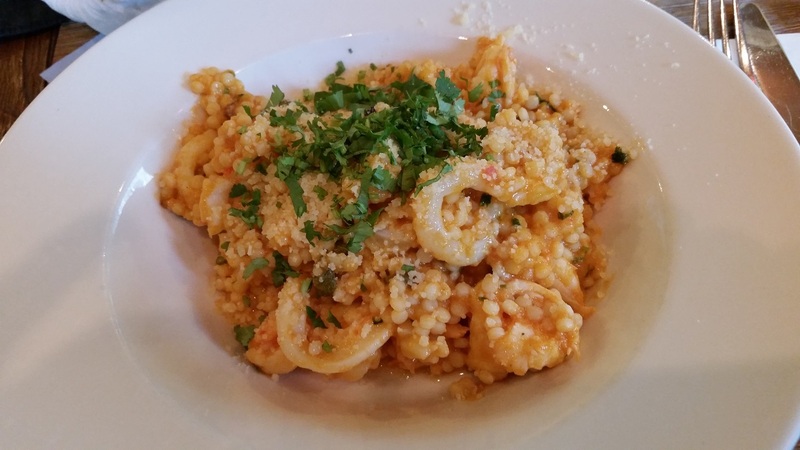 Uh oh… My main was coming, the Sicilian couscous. Not the usual thing you’ll order in Estonia, especially since shellfish has never had as much traction here, but that’s obviously changing with the healthy amount of shrimp and squid in this dish. I usually hate couscous because it’s so bad when cooked badly, but these were done perfectly, flavourful and plump without losing its texture. Excellent bit of cooking here. After a chat with the staff (so glad to be able to converse in Estonian again!) I headed out happily. I would have killed for a place like this when I lived here 15 years ago. Affordable, excellent stuff, a neighbourhood gem. 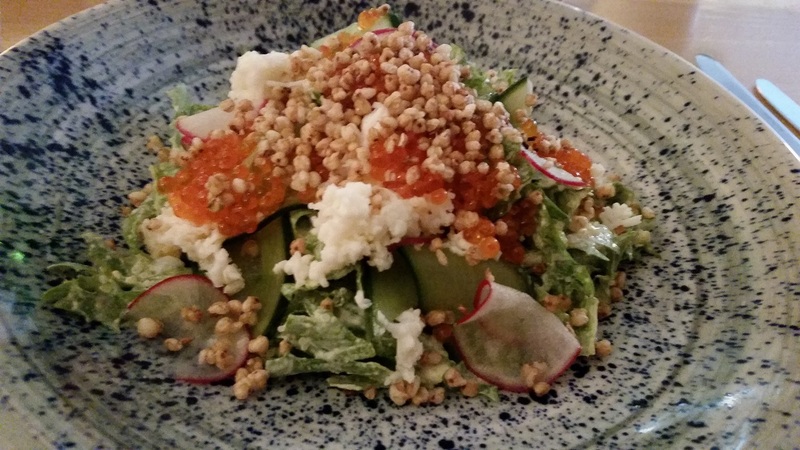 If you visit anything around Kadriorg such as the gardens or the park or the presidential palace, I do recommend a trip to Salt for lunch or dinner. Even if you’re not in the area, it’s a quick tram ride. It’s worth it, trust me. I made my way to my favourite restaurant in Tallinn, Ö, for dinner this fine Wednesday evening. I was so looking forward to yet another wonderful tasting menu, taking the best of local ingredients with amazing cooking. My last tasting menu here was very memorable, and my expectations for this place over the years have always been extremely high. I was given a nice seat near the window close to the kitchen, where I got to enjoy the aroma of their craft throughout the evening. My server was utterly fantastic, professional and knowledgeable of each and every ingredient in both Estonian and English. Generous with the wine pours too for the pairings. I relaxed, already sensing this was going to be a fabulous night. First to arrive was the amuse bouche. What a beautiful display. 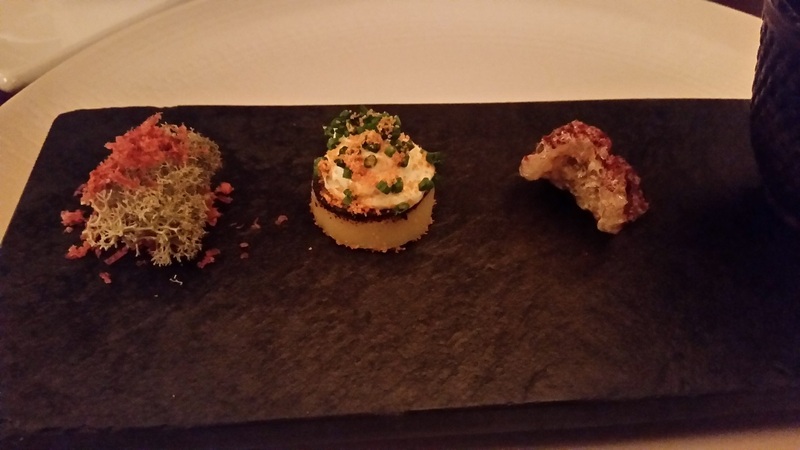 The first (on left) was moss with shavings of game sausage. Love the texture of these things! The middle was a small potato cake with roe, again fabulous mixture of flavours. The third was a piece of crackling with some berry, a nice mix once again. Not pictures on the side was a “herb shot” — a very concentrated herbal juice drink. Wow, my palate is beyond clean now. A great start! The pairings also began at this point, and I do apologise for 2 things now. First, I forgot to write down the pairings. Second, the photos came out a little bad once again. 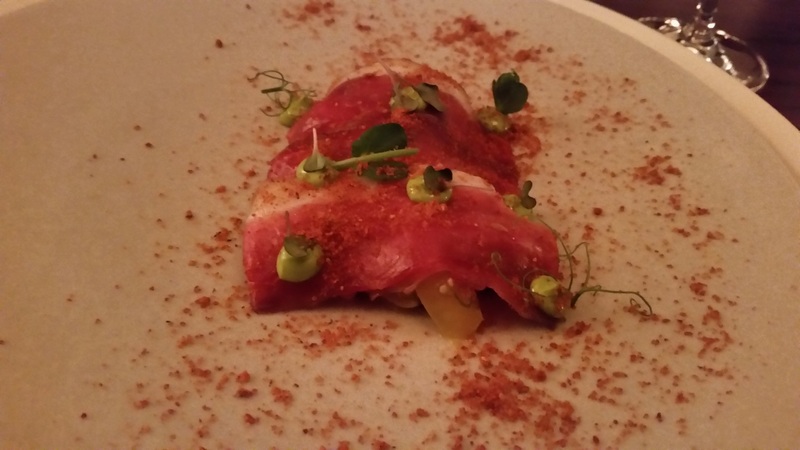 This phone camera has a problem with focus when the light is dark and you use the stabilisation feature in low light… In any case, the first course was smoked duck with tomatoes. Now the combination of flavours here was just beautiful. 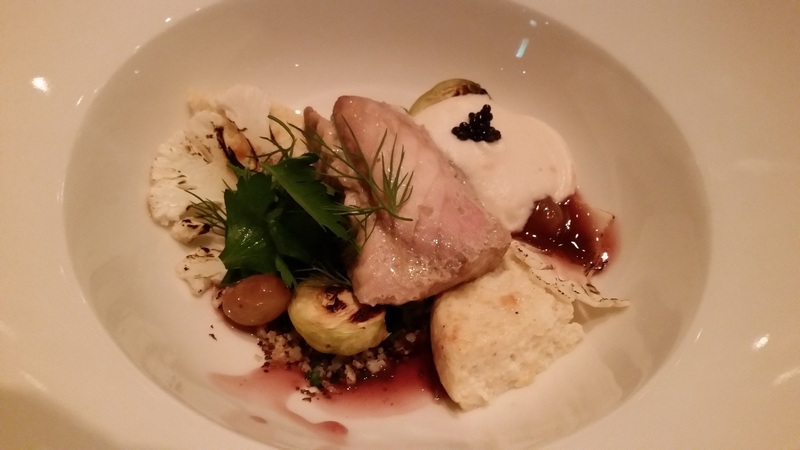 The local sourced duck was sweet and delicious, changed the way I think about Estonian ducks for sure. The heirloom cherry tomatoes were hay-smoked and adds tanginess and complexity to the overall taste. Excellent! 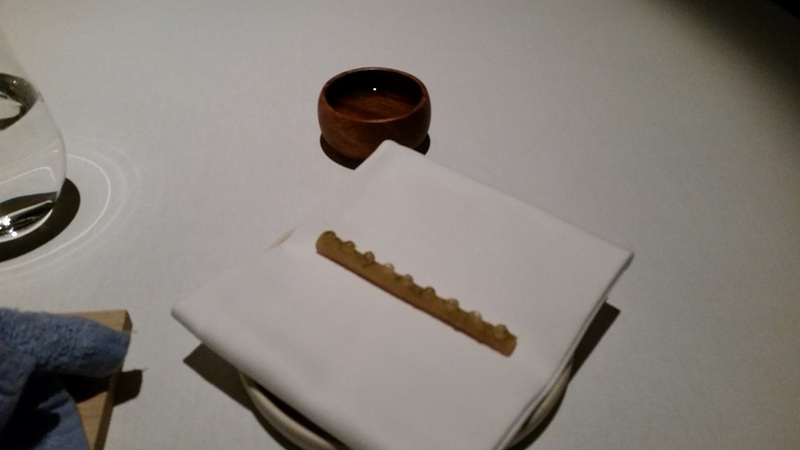 The second dish was salt-baked celery root in a celery tasting of sorts. I’m not a big fan of celery though I do like the root. A bit of a “trying too hard” dish here, but done well. The third dish was next, and we return to fabulous. 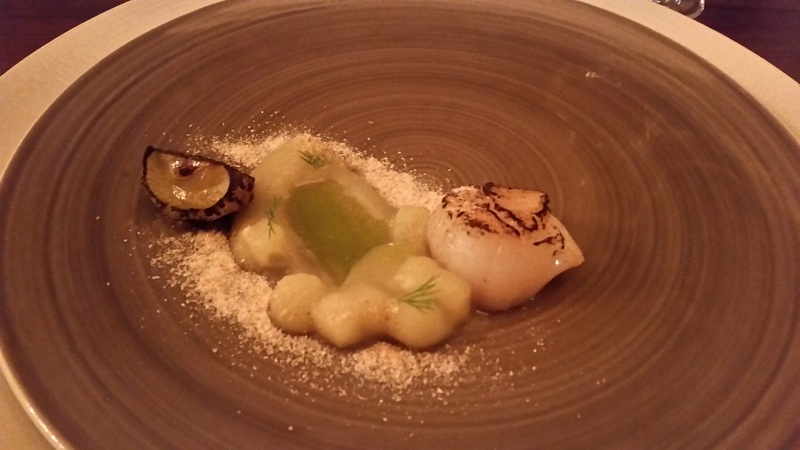 The scallop was seared just on one side, and retained the sweetness very well; the other side was charred by a burning juniper branch, and you get a strong feel of it that works well with the sweet scallop. The accompanying local apple complemented this dish perfectly. Impressed! We continue with seafood for course five with local flounder. 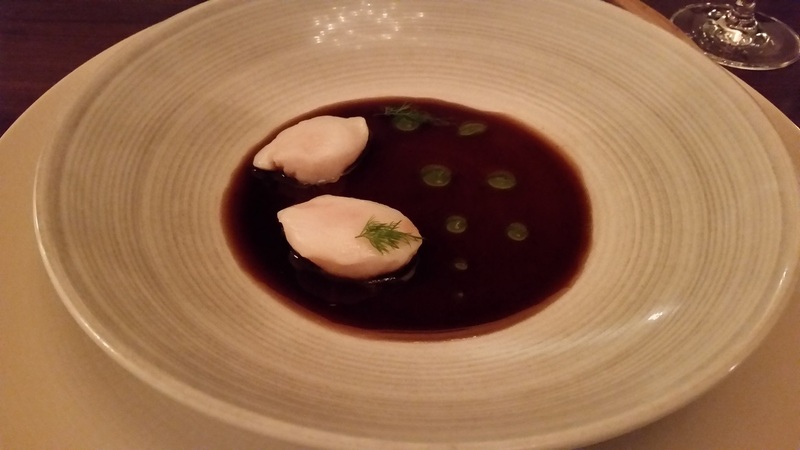 A very meaty flounder from the depths of the Baltic Sea, the wee bit of dill oil was a nice touch. Excellent stuff. 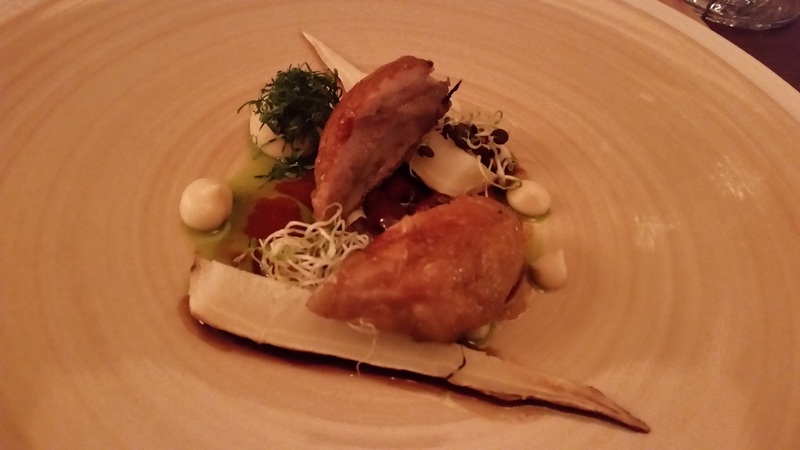 We now shift to the meats with one of the dishes of the year for me, the smoked quail. Wow. The aroma of the hay-smoke was just incredible. 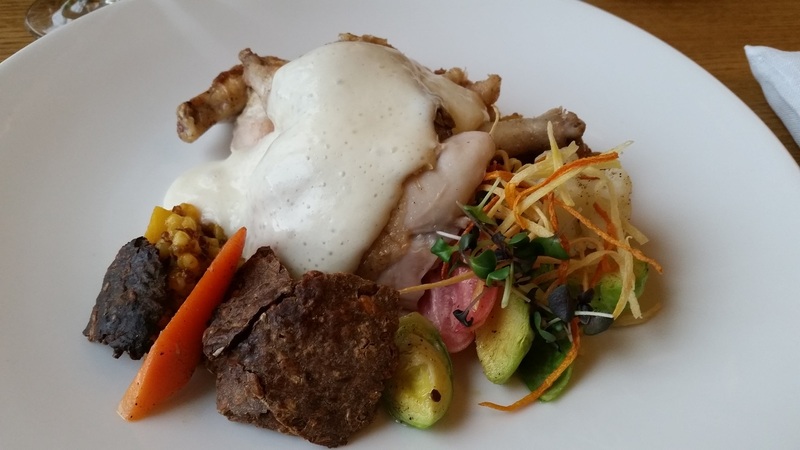 This quail, sourced from the south of the country, was just decadent. It was very fatty, with an incredible layer of fat you rarely enjoy with quail. Perfect season for this! Excellent parsley root and also (hard to see from bad pix, sorry!) a bed of quail hearts under the bird! Wow, what a dish! I’d thought anything after this would be less than awesome but the final savoury dish was spectacular, beef from the island of Saaremaa. Cooked perfectly, utterly tender grass-fed stuff. 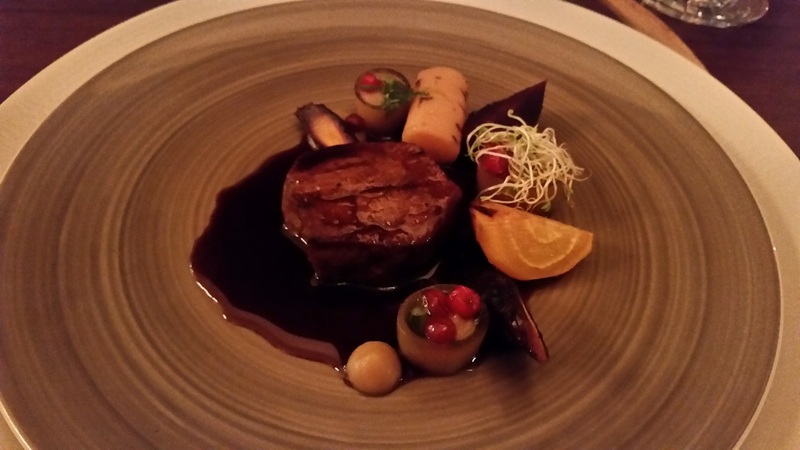 The Estonian beef industry is really impressing me, the stuff from Saaremaa is fabulous. And cooked perfectly here! Here now we have a quick palate cleanser of caramel and dandelion foam. 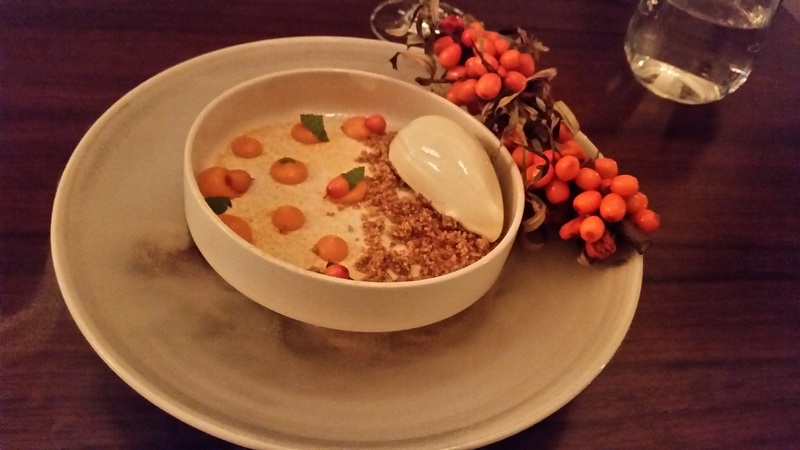 Then we moved to the dessert, this time seasonably based on the pumpkin and sea buckthorn. Wow. 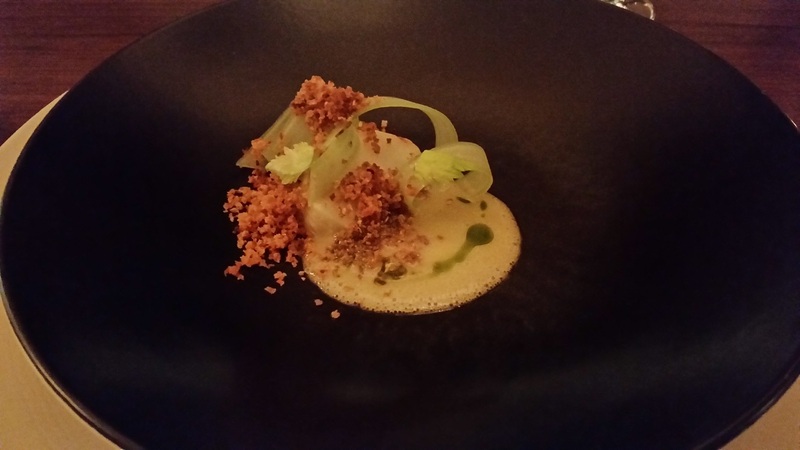 I really loved this tasting menu, one of the best of the year. Extremely happy with food and service, which was all top notch. Seriously, this place blows overrated Copenhagen hipster-driven eateries away. 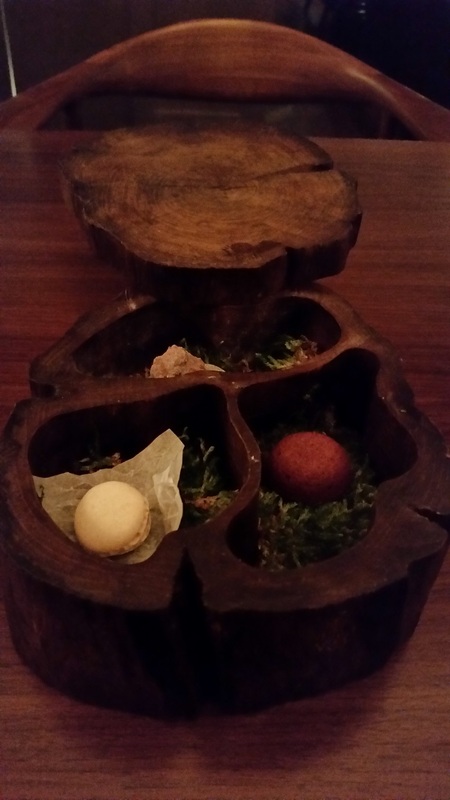 As I relaxed with a calvados the petit-fours arrived in a cute decorative box. I soon finished and walked out into the crispy night happy with an amazingly good dinner. Easily the best restaurant in the region, one of my favourites in all of Europe. Worth far more than a detour to visit, trust me. I was still plagued by jetlag on this trip even though it was on its tail end already, which was a bad sign. However, I had to marshall on. I had barely slept, and actually fell back asleep close to 6am…not good, as I have to meet another dear friend at 11am for a coffee. She had just given birth a few weeks earlier (more evidence against fear the Estonian birth-rate is diminishing!) so we had the chance to catch up while the baby slept happily in his stroller in the cafe. Afterwards I headed back towards where I was staying but wanted to grab some lunch, so ducked into a place I had been familiar with for nearly 2 decades — though it had changed in a major way. Leib Resto & Aed now occupies most of what used to be Šoti klubi (The Scottish Club), where I have drank way too many drams over the years of hard-to-find single malts, where I also saw an old friend get married. So it was a familiar walk up those stairs through the garden into the restaurant. Estonians are almost as fanatical as Latvians over their bread, and the name of this restaurant means “Bread Resto & Garden” — if that says something. 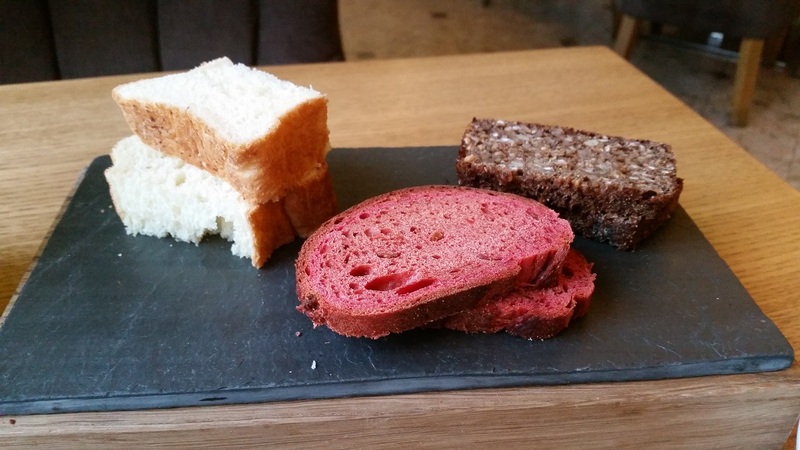 So of course the bread service was excellent, good Estonian black bread. Mmm, I’ve missed these. I dug into them so quickly I forgot to take a picture. I ordered and cooled off with a glass of rose and relaxed. It’s so good to see this place full for lunch, with a crowd that’s prominently local. This is the growing economic confidence of Tallinners I like to see, and supporting good restaurants focusing on locally-sourced foods. My starter soon arrived. Oh, I need to remind myself not to order salad when I am in Estonia… Not that the greens and veg aren’t good, but sometimes they overwhelm it with other stuff. This was a roe salad, with a lot of roe as you can see. 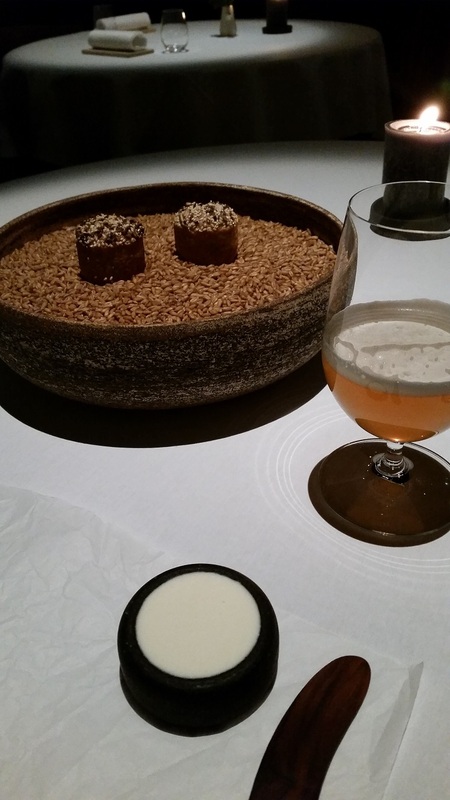 Toasted barley was very nice too. However, this thing weighed about a TON. I almost died eating this, as it was so crazy heavy… I barely survived this, and I have a main course? At this point I was pleasantly surprised listening to adjacent table of a young Finnish couple who happily ordered in English. This always makes me smile as yelling in Finnish seems to be something an older, ruder generation of Finns do — treat Estonia with little respect as if it was their private playground. Kudos to these two. And before you say another word, I spoke only Estonian here. And elsewhere. I only switch to English if the staff insist on using English. Even in Latvia, or France, or anywhere I would switch into English only if they spoke English first, or if I ask them to. It’s called respect. 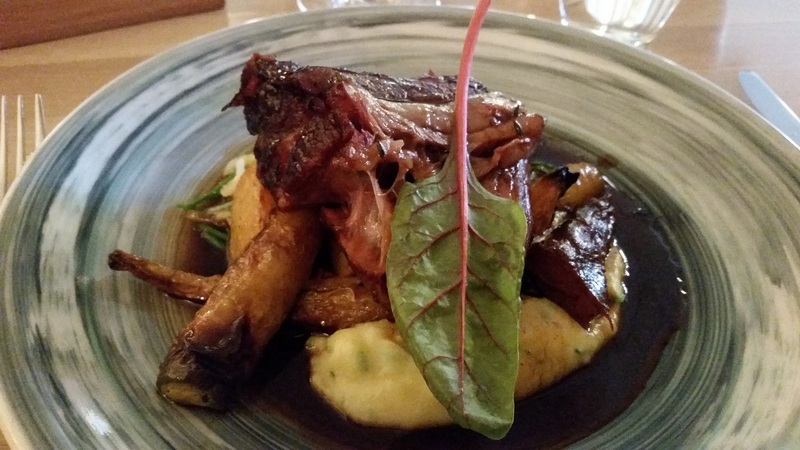 This was a beautiful, if not utterly voluminous serving of shortrib. This slow-cooked behemoth, from locally sourced grass-fed beef, was smoked before being treated to its slow braise. 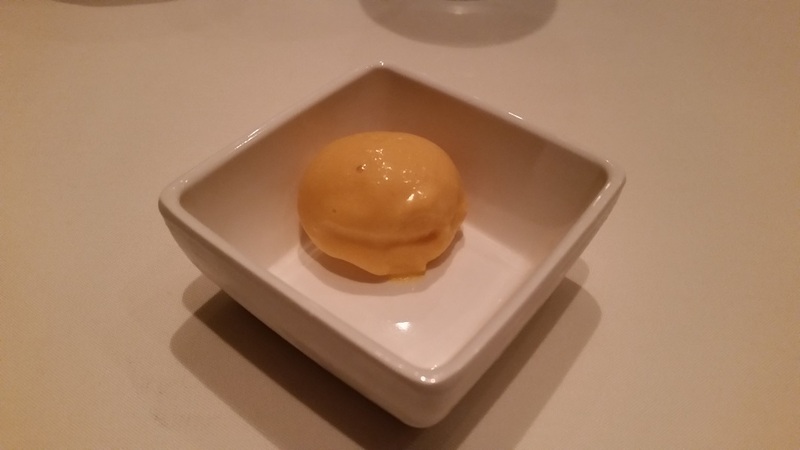 Resting on some potato puree, this was huge — and I was already slowing down thanks to the voluminous roe salad. I enjoyed a bit more wine to cool down (started to sweat again! ), enjoying this very heavy lunch. The starter was a bit suspect but the main was excellent, if not also too voluminous for lunch. I enjoyed this, not just for good service (better than last night at Cru, which was a little haphazard and linguistically confused) and nice wines, but to be sitting in a place I had been coming to since the crazy 1990s seeing it reborn in such a nice way. And once again, I am very glad to see so much of the food sourced in Estonia, as there is certainly much pride from the cooking community for products of their farms and nature! Worth checking out, but keep this review — all aspects of it — in mind! Yes, there’s a few missing days between reviews but that’ll be explained after the major reviews are done next week… I had arrived “home” in Tallinn the day earlier and I had a rather busy but productive Tuesday — including running some much-delayed errands, visiting the grave of a martyr of Communist violence, and making some deliveries for people for stuff brought from across the Atlantic. Finally time for dinner, checking out the much-raved-about Cru in the Old Town. Helmed by the celebrated Dmitri Haljukov, who is leading Estonia’s team to the Bocuse d’Or in 2015, I was really looking forward to seeing what he can do. My dear friend, who was less than a week from her due date, joined me — so the evening was much more restrained and relaxed. We had a wonderful time catching up at the small hotel restaurant as I sipped at some wine before we both ordered. A quick amuse of “cream of sauerkraut” appeared. Not what you think, Estonian sauerkraut is very lightly flavoured compared to its German cousin, so this is more of a “cream of cabbage” to be honest. Quite nice. 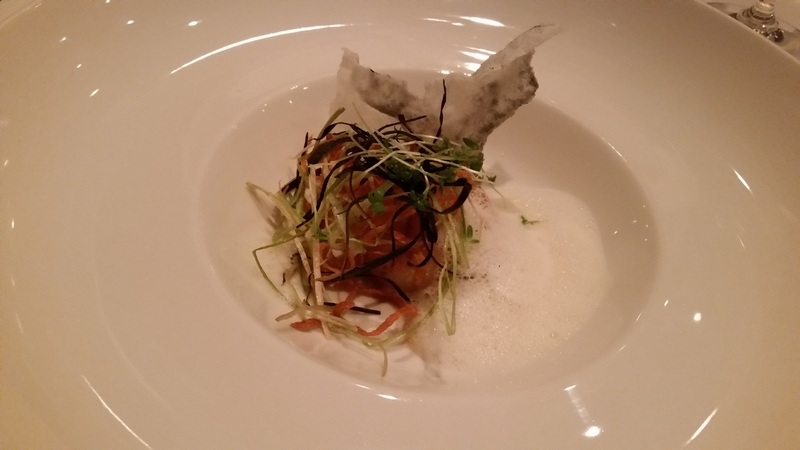 Following this was my starter, the so-called “Nordic Sea” — a seafood salad. 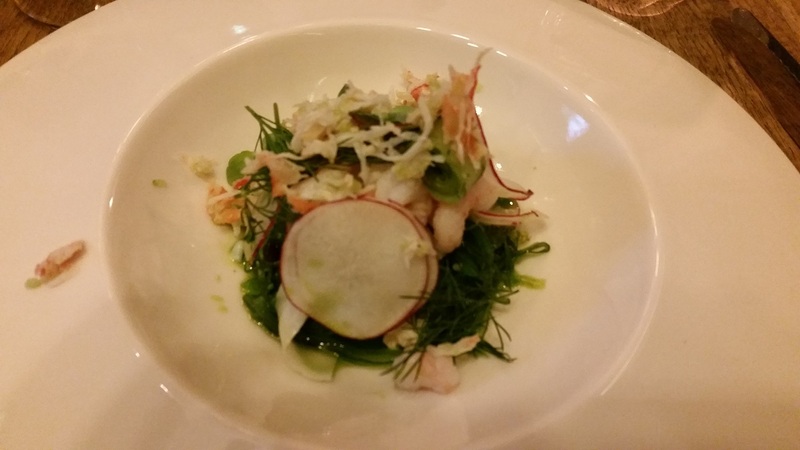 Nevertheless the salad was not bad, though the main ingredient, the king crab, seemed a bit wanting. The salad had a bit of shrimp which was not bad, but nothing special. The star was actually the plethora of seaweed, which was wonderful. So far it’s been “meh” (sorry I usually hate that word but so apropos this time) but it’s not spectacular. 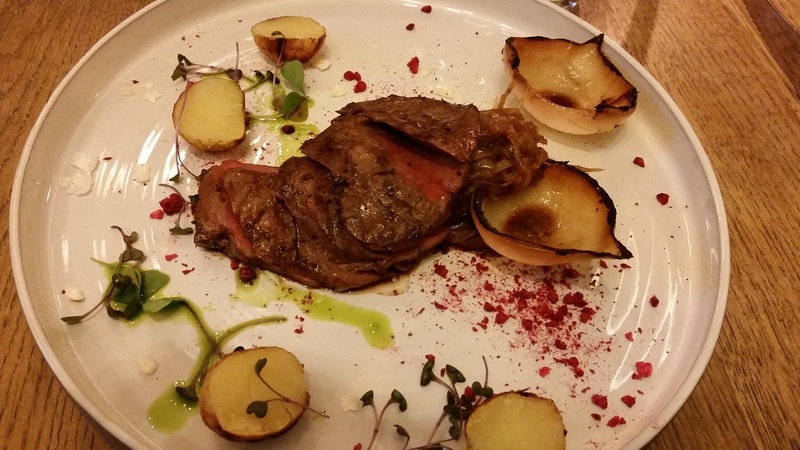 I was very much anticipating the main course, the “Brave Heart” — grilled lamb heart. I love offal, especially the harder-to-get lamb stuff, so always take the opportunity to have it. 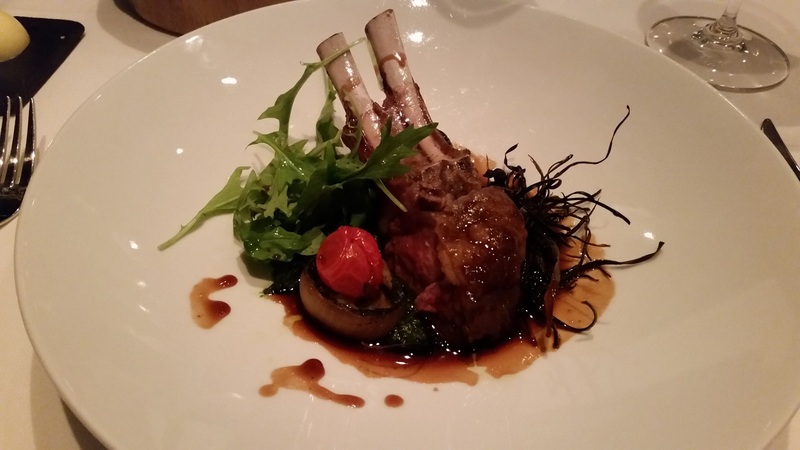 This is one of chef’s signature dishes, with the well-cooked meat accented by onions and ramson. The heart was tender and tasty, would fool most diners into thinking it was another cut of meat. Done very well, the flavours were very complementary. Me and my friend chatted into the evening until her ride, and we did partake in dessert, but for me was a little after-the-fact (I guess the fact I earlier forgot I had dessert says something?). I would say this meal was good, though it didn’t blow me away. The lamb heart was done very well, and I am very happy to see it on the menu. 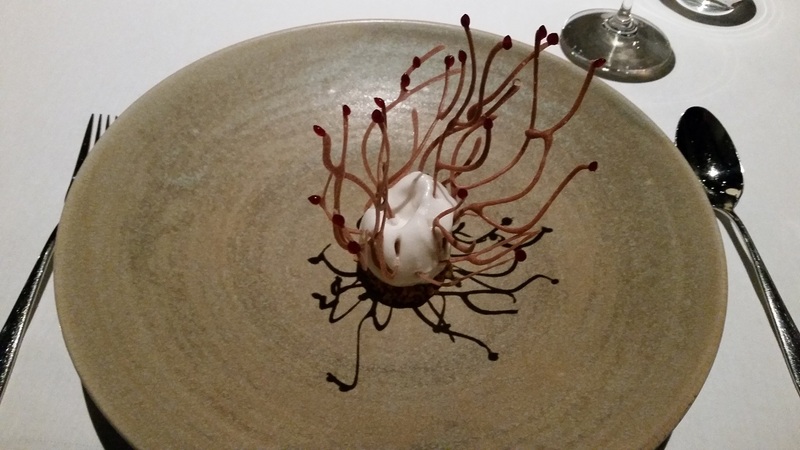 But perhaps I had too much expectations because of all I’ve heard about this chef, especially comparing it to the unmached Ö — where I will be returning for dinner the next evening. So after a short rest I headed out slightly outside of Old Town Riga for the much raved Hotel Bergs, which contains the restaurant of the same name Bergs. I was looking forward to a nice tasting menu for the evening. Considering my lunch, my expectations for this place was sky high. 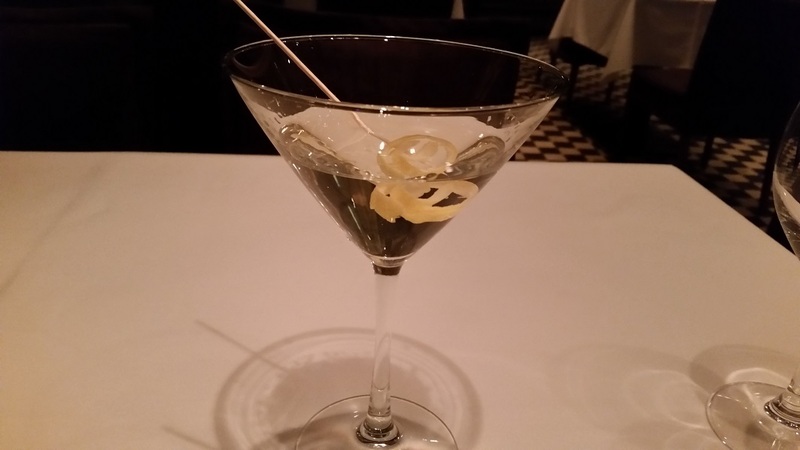 I sat down and relaxed and asked for a martini — a good way to test establishments. I’ve received undrinkable swill and even a tumbler of Martini vermouth on the rocks from Michelin-starred restaurants in the past, so I was pretty happy with this one with a nice twist. By now the pairings have begun, and I do apologise I forgot to jot down the wines on this dinner. But for the most part they worked pretty well. 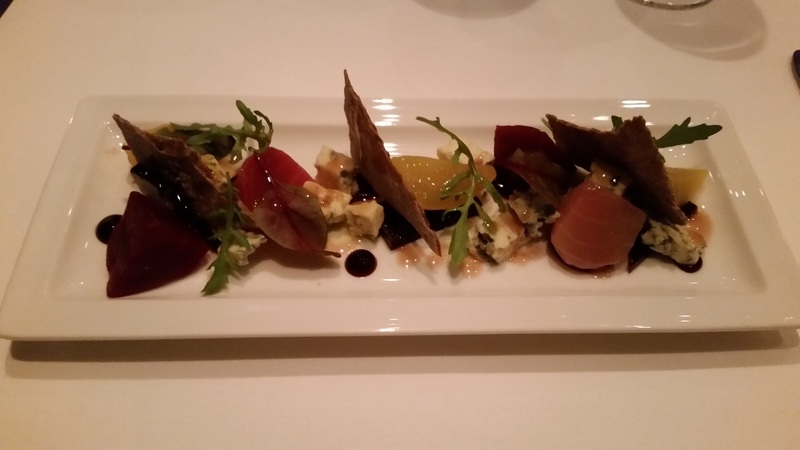 The first course arrived, a very regional typical dish — beets. I personally love beetroot and would have done this dish a la carte too. The different coloured beets brought out a different tinge of the beet range, from the sweetness to the sharpness and everywhere in between. Nice dish, simple but delicious. Next up, scallops. Believe me it’s under this, seared lightly. Nothing special to be honest, foam did little (I do not like foam as my readers know) and the strings seemed more nuisance than enhancement… Oh well. This lowering in expectation for tonight was sadly augmented (or should it be diminished?) by the worsening output from the piano. The courses were divided by a quick intermission of sea buckthron sorbet. The tanginess of this beloved berry was much needed with my growing headache. I gotta say when he decided to play some light jazz it was perfectly good and complementary to the meal. But when he sunk back into “standards” it was disastrous. For the third dish we had sturgeon. 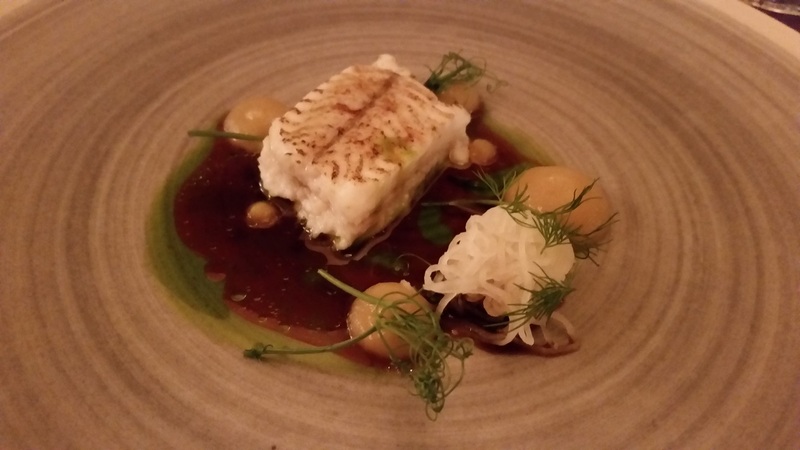 I love sturgeon and this was a good dish, the fish cooked well. The cauliflower was a nice touch and the horseradish cream was an excellent accent. 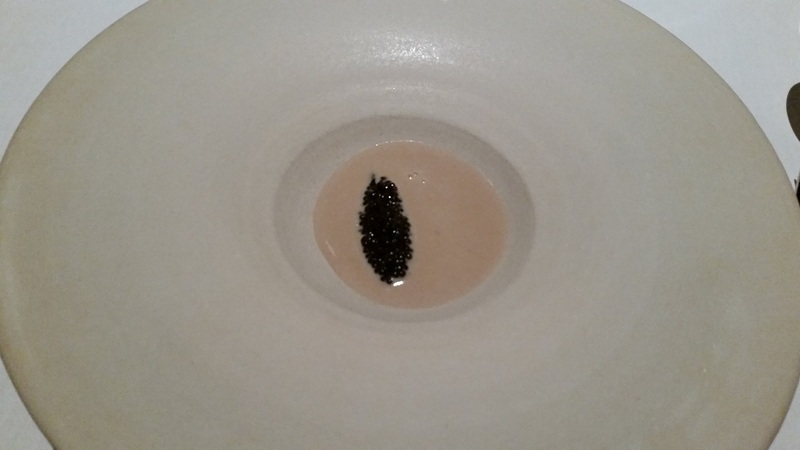 The dropping of a bit of caviar on top of the cream was showy but unnecessary — sadly a relic of places that thinks it’s not “top dining” without caviar or gold-strewn desserts. I sense the waiter knew my struggles so the dessert came quickly. After an excellent evening at 3 Pavāri last night catching up with a dear old friend, I spent Saturday morning having a coffee with another friend before I went to explore the food of Riga on my own. Even though I was on the other side of the centre, I decided to trek all the way back and explore a much-talked-about restaurant called Bibliotēka №1 (Library No1). This relaxing restaurant on the edge of Vērmanes dārzs (Vērmane Garden), which just celebrated its 200th anniversary, is decorated with its namesake in mind, with books as a nice decorative touch. I was looking forward to this lunch, and was even more excited when my excellent server told me the specials. One of my goals of eating Latvia will be reached today in a pleasant surprise. Will say more later. 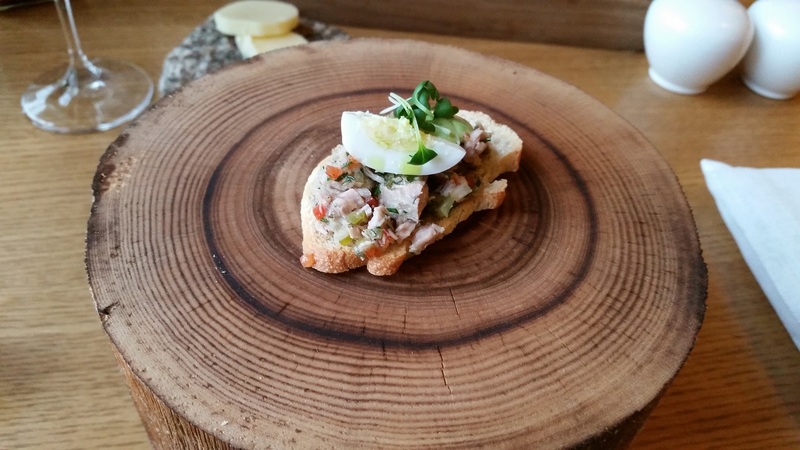 Then they presented a small amuse on a cute wooden trunk, a small tasting of tuna. A nice start, but I was really looking forward to my starter, which is just in season and was the day’s special — lamprey. I know, some of you are like…yech… But these house-smoked treats are really a delicacy. Many hate it, but if you like it, you really like it. These were in season, and were extremely plump. You can see they are full of roe, which are utterly decadent. There was even the liver of the lamprey (not show) inside, with a rich creamy taste that just added to the depth of this generous serving. Wow! The eggyolk was a nice touch. Then it was brought back to the kitchen for plating before it returned. The meat was extremely tender and juicy, the rye crust more than doing its job keeping everything moist. Didn’t need much of the sauce, as the chicken was one of the best chickens I’ve had this year since the excellent jidori I had in Tokyo at Hinaiya. I was spent after this, no room for dessert. Now this was a fantastic meal, and it turned out to be one of the highlights of the trip — and certainly the best meal I’ve ever had in Riga. Excellent service, attentive and knowlegeable, with good wine (and generous pours) and fabulous food. You can’t ask for anything more! If there is a place in Riga that’ll drag me back it is this place! Heavily recommended!